Like many children, when I was very young, I was turned off by most vegetables. 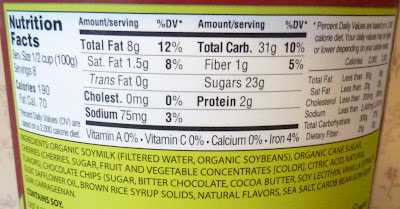 I ate the basic stuff kids ate—peas and carrots, maybe some steamed broccoli here and there. But I remember being terrified of zucchini. I'd heard of zucchini bread and wondered what kind of sick person would ruin something as delicious as bread by baking a vegetable into it. After eating pan-fried zucchini from our garden once or twice and being relatively impressed by it, I got brave enough to try zucchini bread, too. I thought it was scrumptious. It works for the same reason pumpkin pie works: it's a unique vegetable surrounded by bread and sugar. On its own? It may not be quite as dessert-like, but as long as there's some oil and seasonings involved, it's certainly not bad. Some of you might remember the carrot spirals we looked at last year. Same concept here, except with—you guessed it: zucchini! I didn't feel like the zucchini was quite as versatile as the carrot, quite honestly—at least in terms of the product pairing with pasta sauces and that sort of thing. When I first heated the zucc spirals per the instructions, I felt the result was a bit too chewy. There was a subtle crunchiness to the vegetable, but there was also a slight stringiness. 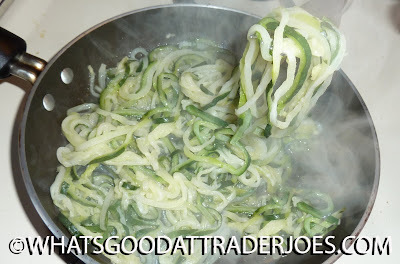 You can see in the picture above that the zucchini maintained its green and white colors after heating on the skillet for about nine minutes, as per the instructions. It still appeared essentially the same as when it's raw. Sonia pointed out that zucchini is a much fleshier vegetable than carrots, and for that reason, she thinks the carrot spirals are the superior product. When I fried the zucchini spirals in olive oil, they browned up nicely and got a bit more crisp and flavorful, in the manner of zucchini fries, albeit much longer and thinner. At that point, I was fine eating them with just 21 Seasoning Salute and a bit of extra sea salt, although I'm sure there are plenty of other sauces, dressings, and maybe even grated cheeses that might go with them. Three and a half stars from Sonia. Three from me. Oh goodness, I love those words. There's so many things that those words signify. For our family, that almost always means it's Friday night, after a long week of work, and right before a weekend full of familial nonsense like Costco runs (more pizza!) and stuff like kid birthday parties (usually even more pizza!). It means it's time to kick back and relax a little, and chow down on some comfort food. I mean, it's tough to beat pizza. Ask my kids - it's one of few foods we don't have to beg, borrow, and deal with them about. They'll happily chomp it right on down. Easiest dinner this side of mac and cheese, or ice cream sundaes. Eat pizza, pizza yum. Good times. 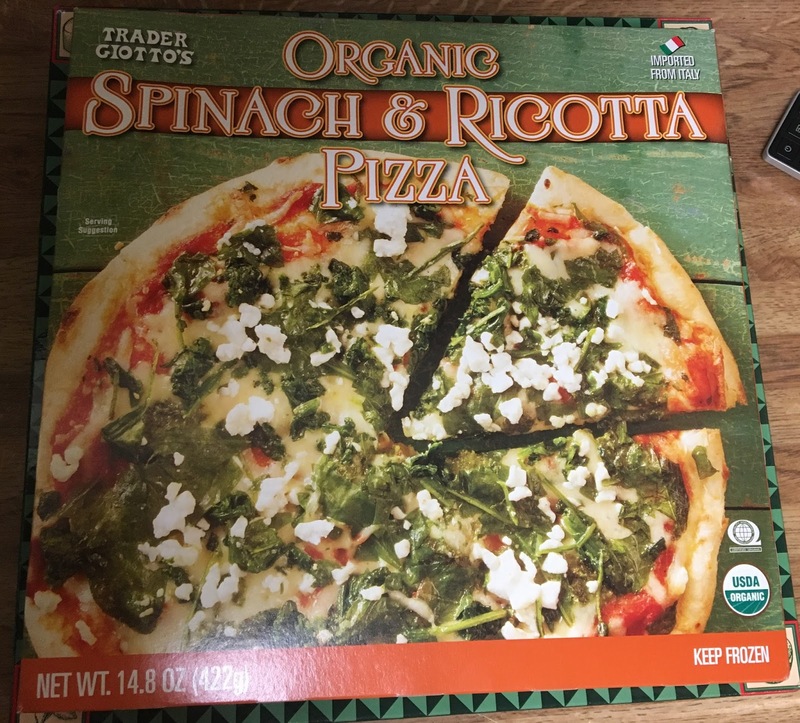 Yes, we love pizza and what it means...but when I think of pizza, I don't think of pies like Trader Giotto's Organic Spinach & Ricotta Pizza. I mean, organic? Spinach? That sounds...kinda healthy. I prefer stuff like buffalo chicken or pepperoni or sausage or basically any kind of meat. I want me greasy comfort, not healthy freshness. And ricotta? I have a love/hate with ricotta. Mostly, I love avoiding big globs of it, because I hate big ol' chunks of it. It's one of those "less is more" type deals for me, for sure. Surprisingly, I enjoyed this particular pie, though. It's not a new favorite, by any stretch, but it works. The key seems to be the sourdough crust - first of all, it tastes fantastic. It's not overly sour, but has just the right touch to offset the thin coat of marinara and play off it a bit. It also helps that the crust is thick and doughy and a little chewy while still getting a little crispy on the bottom. Sandy says she wishes she baked it a little longer than the box instructions dictated to be a little crispier, but nah, was great as is. 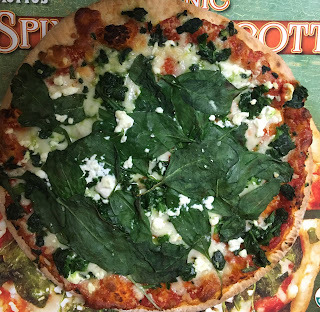 And as you can see, there's plenty of spinach atop as well. 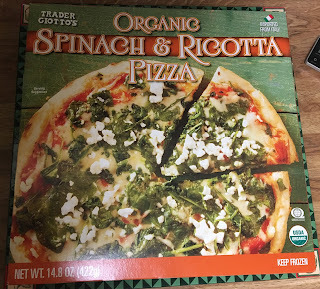 Nothing too overly special about that - I mean, it's just spinach, but I was pretty happy with how much there was. It helped hide the ricotta a bit. I guess if you're a ricotta aficionado, you may be disappointed with the small crumbles here and there. But for me, I was happy. With the ample mozzarella, it seemed to be more a light creamy touch here and there, without overly affecting either the overall flavor or feel of the pie too much. That's a plus. 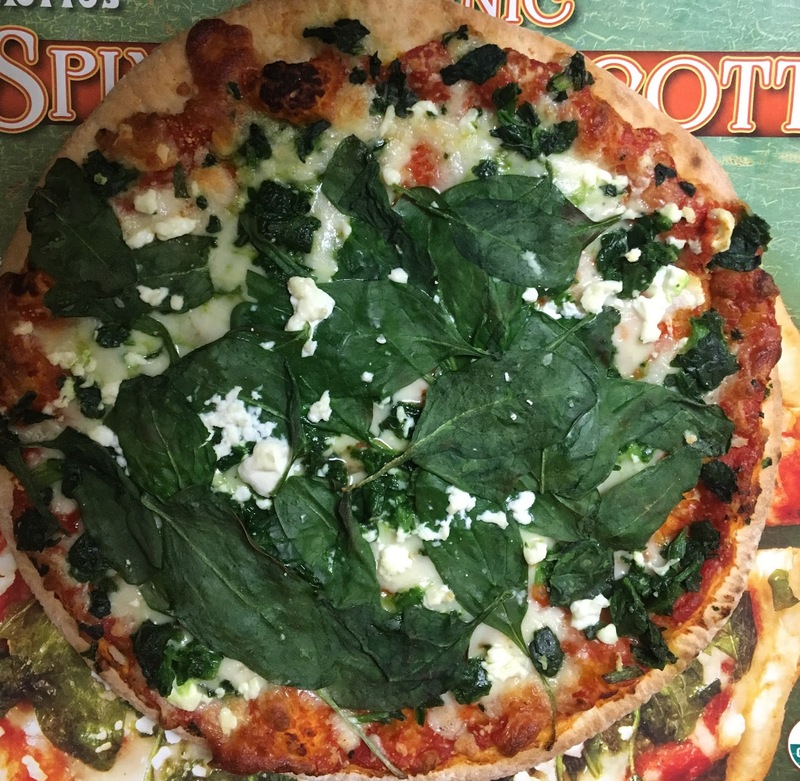 Both Sandy and I had to shake a little red pepper flakes to liven up the spinach ricotta pizza a little, which worked great. As you can imagine, without the flakes it was a little plain tasting overall. But in all, it's a solid pie, if not my ideal version. Bonus points for it being a Giotto product - I miss all the different names, and they seem so few and far between these days. It'll be an occasional pick-up for our many pizza nights, I'm sure. One of the best parts of being in an intercultural marriage is coming to understand and appreciate the other culture just a little deeper than one might have been able to otherwise. I still don't embrace things like feeding dead relatives on Dia de los Muertos—but then, Sonia never did either. But the food? Mexico has some of the greatest culinary traditions on the planet. And in Sonia's own words, "Mexicans don't eat bland food." She's not claiming that every dish has to be scorchingly spicy, but that it should at least boast bold flavor. We see plenty of ingredients here that one might find in dishes from south of the border: cotija cheese, corn, cilantro, poblanos, jalapeños. But the overall effect? Not particularly flavorful. The salad was fresh, and there was a good mix of cabbage, quinoa, rice, and corn. They were a bit stingy with the cotija cheese, as we've seen in at least one other TJ's product. Five bucks for this salad, which allegedly includes four servings. 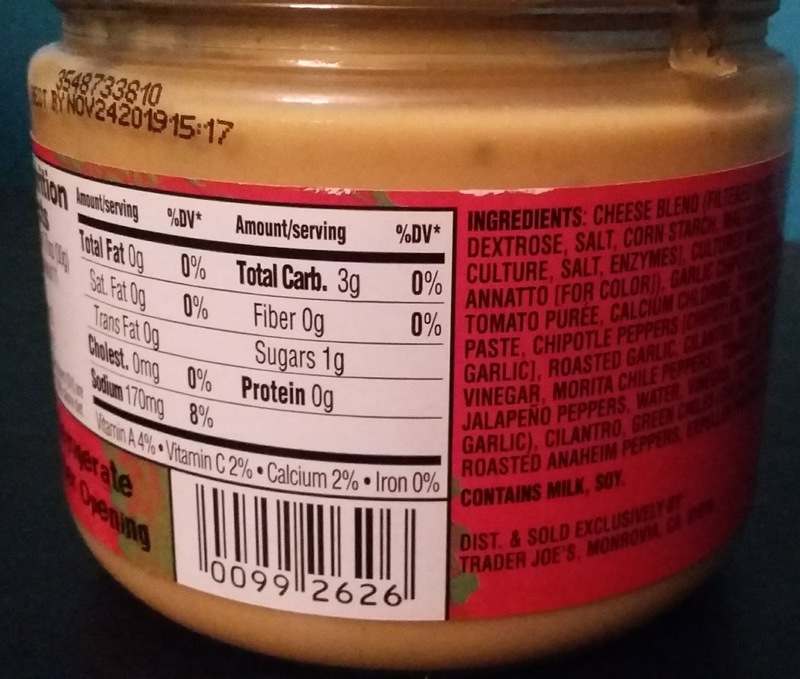 560 calories and 28 grams of fat in the whole container—significant, considering the subtleness of the flavor. And one more complaint: I found it very difficult to mix the salad around in the container without spilling elements out of the tub in every direction. It's not the end of the world, particularly if you're eating this at home. But on the go? At work? Might be a little inconvenient. 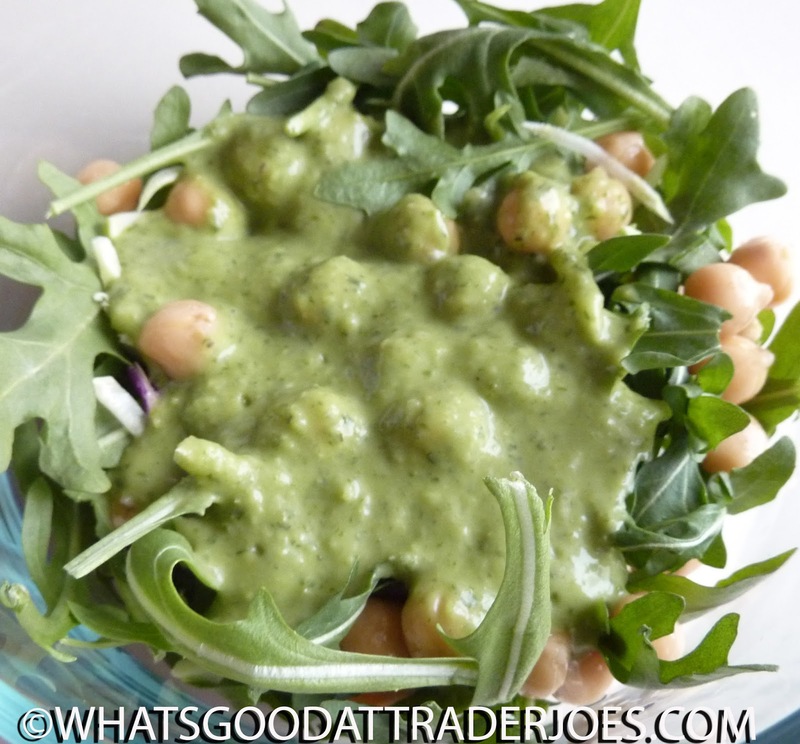 There's plenty of roughage and fresh, quality ingredients in this product. There's nothing particularly wrong with it. 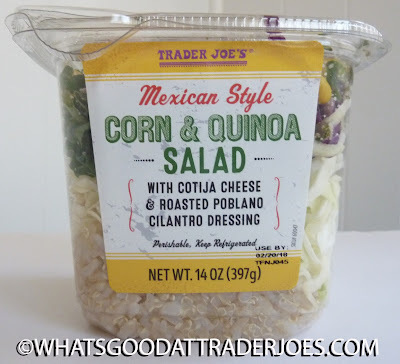 This salad's just not tasty enough to call "Mexican Style" or to warrant a repeat purchase. Two and a half stars from Sonia. Three from me. 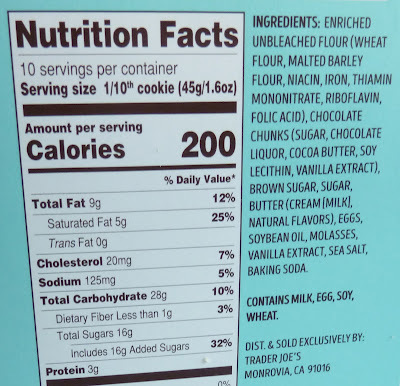 As a family that has no gluten sensitivities or celiac concerns, there's invariably and irrefutably one factor that makes or breaks a gluten free product for us: the texture. Most GF items we've had taste fine or just good enough, but if it feels wrong, ugh. Or conversely, if the texture is just fine, that's an absolute bonus. A recent family snack favorite (non-TJ's division) has been Snyder's of Hanover Gluten Free Mini Pretzels. Not only do they taste awesome but they have a terrific, tight crunch that's even better than a regular pretzel. We gobble them down, and are an absolute winner. And yes, we are aware that TJ's has a gluten free snack pretzel option. I don't believe they've been reviewed, but we've had them. We just like the Snyder's better, so there's that. 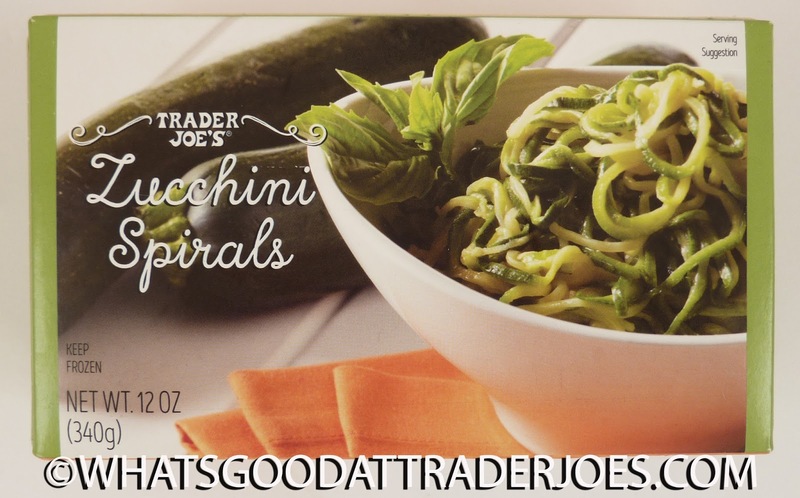 But what Trader Joe's does have is Trader Joe's Gluten Free Egg Fettucine Pasta. I'd be hard pressed to notice a difference AT ALL between these gluten free noodlers and the plain ol semolina variety. It's nearly a perfect copy. Even more impressive considering the first ingredient is rice flour, which I typically liken to making stuff taste and feel like wet newspaper. I would think might some sort of corn conglomeration would do it, but nope, rice. Amazing. I wish I could really go into more detail, but think of a really good egg noodle, and that's exactly what these guys are like. What more can I say? What higher compliment? I can think of none. Even our kiddos loved them. M, our oldest, enthusiastically gave them two thumbs and 10 toes up, and she's normally the first to grimace about anything. It may have helped we had these for dinner in butter sauce with shrimp, which are two of her favorites. We all wolfed them down. 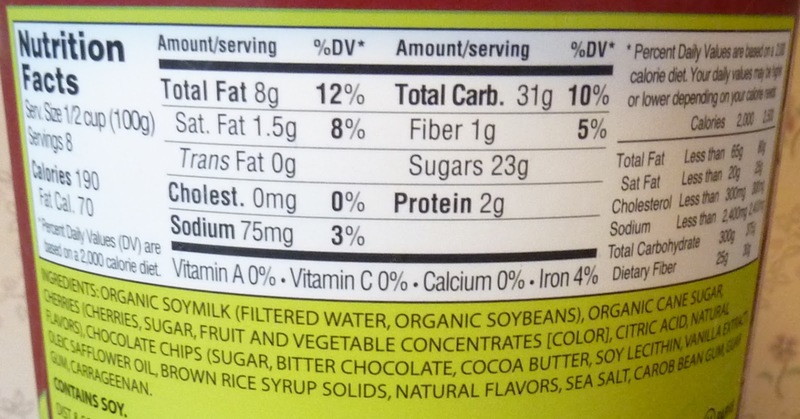 Which brings to one slight negative - it's only three servings per bag, which is kinda an odd number. For our fam, and perhaps yours, two bags would have to do it for dinner, especially when our kids' appetities will rival ours. Regardles they were fairly inexpensive and readily available in the refrigertaed section, as these are fresh noodles that cook in literal minutes. Which makes them even better for our busy fam. As ones who choose to forego gluten when possible, these will become a staple I'm sure. Double fours. When Trader Joe's offers up female-themed, gender-specific products like this one, I always have to do a self-induced Man Card check. I mean, one could argue that Trader Joe himself is a dude, and that nearly every product in the store has a dude's name on it. But a chick purchasing Cowboy Burgers or Cowboy Caviar? Nobody bats an eyelid. I buy Cowgirl Bark—and the female clerk that rang me up actually called me out on it. Other parts of that classic review were indeed fictional—and me calling my own review "classic" is absolutely meant to be as tongue-in-cheek as you were hoping it was. But the part about the Trader Joe's employee wondering why I was buying Cowgirl Bark instead of the "boy" version really, truly, honestly happened. I send my lovely Sonia in to purchase them while I wait in the car. I mean, I'm well aware that food-blogging about salad dressing isn't quite as manly as, say, felling mighty cedar trees with a hacksaw or driving a monster truck through a massive, fiery explosion, so I'm demonstrating some level of security here anyway, right? I've reviewed mango, pumpkin spice, and even light beer products. I'm secure as heck...right? I guess if I even have to ask you, then I already have my answer. Oh well. Insecure or not, I must say I do like this dressing. It's super thick, but relatively smooth, and it tastes as green as it looks. It coats everything it touches, so you don't have to use much with each serving. It's decidedly avocado-y. There's a bright citrusy zing from the lemon juice, too—and underneath those dominant flavors is a subtle, but remarkably unique blend of garlic, spices, and apple cider vinegar. It worked very well on salad, but I think there are plenty of other applications here. It certainly doesn't taste exactly like guacamole, but it could probably serve in the same capacity. It's delicious as a chip dip, and I imagine it would be stellar as a sauce for fish tacos, sandwiches, baked potatoes, or nachos. $3.69 for the small bottle. Even with teeny-weeny serving sizes, it'll go fast, because you'll want to eat it with everything. No weird ingredients, low in calories, vegan. Definitely avoid if you hate avocados or guac. I wish they made a version with some heat. I'm not sure what will pair just right with it... jalapeños? Tapatio? Cayenne pepper? We'll just have to experiment. Four stars from me. Four and a half from my "goddess," Sonia. Congrats, it's been done. It was bound to sooner or later. After eight years and hundreds of reviews, I've been thoroughly stumped as to how to otherwise start a review of a TJ's product. Usually I have a slice of life or dumb joke or mini info-burst about something that at least tangentially has to do with something, but not this time with Trader Joe's Glazed Walnuts with Bourbon Barrel Aged Maple Syrup. I've been mulling it over for close to a week, but I got nothing. Nothing new to say about snacky nuts or bourbon or maple syrup or anything that has to do with these nuts. No great stories. No puns or jokes or anything. Just me and a bag of nuts that sound pretty amazing. I'll grant that these bourbon maple glazed walnuts are good...but odd. There's a definite added buttery taste (it's the second ingredient) that adds an unexpected creamy blast, with all sorts of added sugar too. And not maple syrup-kinda sugar...just sugar. So these are some pretty sweet walnuts, practically candy. There's some sweet maple taste at the end, for sure, but it's really tough to pick up on any bourbon aspects. The package says something along the lines of "earthiness" which isn't there, either, aside from the inherent nutty taste. It's some pretty good quality walnuts, by the way - nice and chunky, definitely munchy, a little roasty. They're tasty by the handful, and would probably be good in things like brownies. 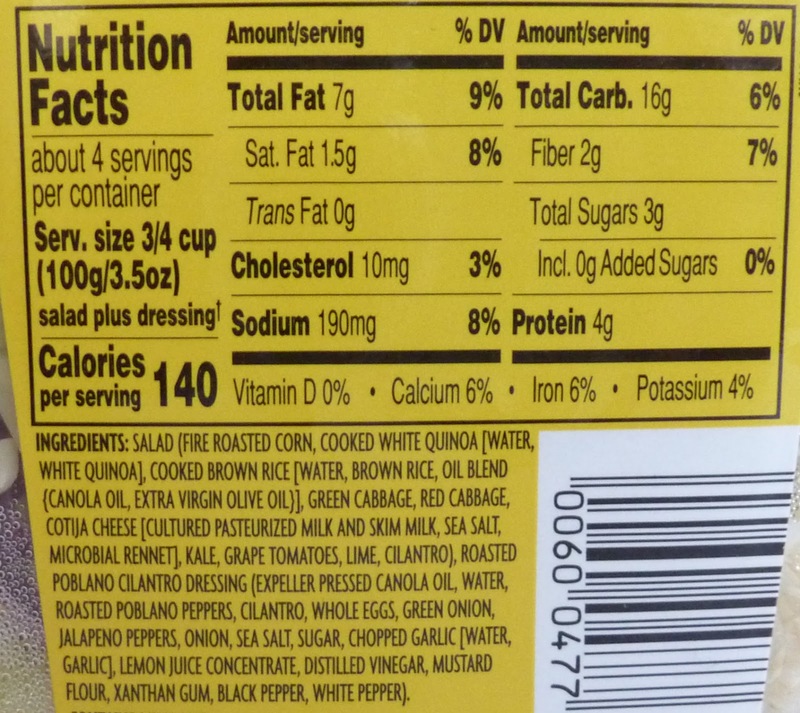 The package recommends atop salad as well - in the right kind, that could work. Still, I feel as if the buttery coating holds back the product from it could fully be - some more straight up bourbon-y maple would be fantastic. Eh well. Still pretty tasty, and both Sandy and I had to hold ourselves back from chomping down the whole bag - they're pretty snackable for sure, so watch out. For $3.99 for a half pound bag, it's a fairly respectable value as well. I'd get them again for sure, and maybe by then I'd think of some sort of wittier intro...but right now, it's just driving me nuts. It seemed to me I'd heard once that, in a pinch, one could use coconut water as IV fluid. I opened up Google and started typing "use coconut water" and sure enough, an auto-fill option popped up that read: "can you use coconut water as IV fluid". Apparently, the answer to that unpunctuated question is... "kinda." There are actually multiple anecdotal reports of doctors successfully administering coconut water intravenously in cases of extreme dehydration when traditional IV fluids were absent. For some reason, I'm thinking these were cases of final desperation, rather than calculated medical maneuvers, but hey, I'm no doctor. I guess the bottom line here is that coconut water is just really darn good at providing hydration to the human body. 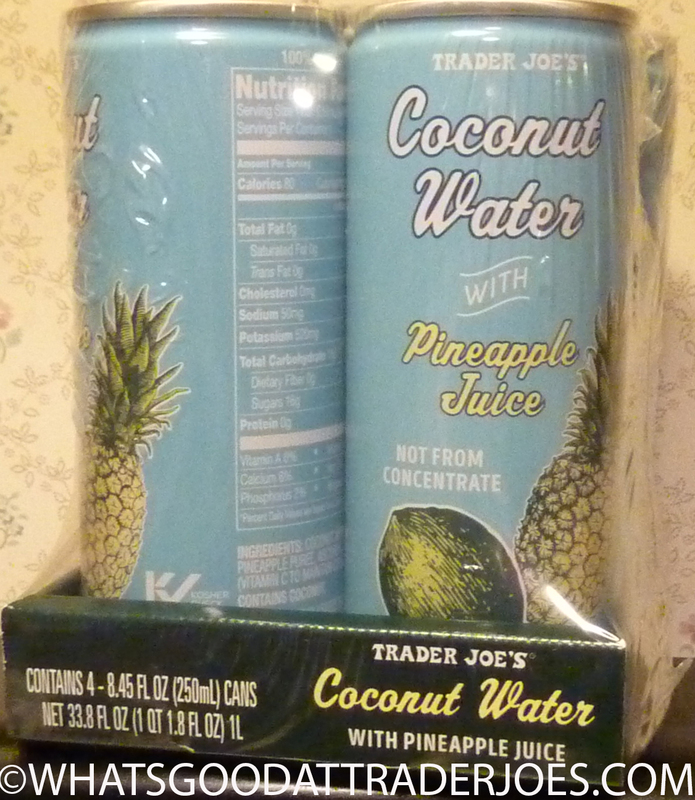 Now I'm guessing the addition of pineapple juice is a big "no-no" when attempting to inject the liquid directly into a vein, but when ingested orally, it makes coconut water a moderately enjoyable beverage, as is the case here. And when I say "moderately enjoyable," I mean that as a relative term. I mean that people who just barely tolerate the taste of coconut water (like me) will tolerate it with significantly less of a grimace on their face now that it's available with pineapple juice mixed in—unless, of course, said person is also not a fan of pineapple juice. Sonia generally enjoys regular coconut water and thinks this mix is even better. "It's like a really watered down pina colada," she says. I won't argue with that, though I'd emphasize the "really watered down" part. It's about $4 for four small cans, which isn't cheap. Sonia would like to point out, though, that while sick with the flu, she used this beverage to stay well-hydrated. Not only that, but there's a good bit of vitamin C in there, too. So if you think of it as medicine, the price point seems more reasonable. Sonia gives this coconut water 4.5 stars. I give it 3. My wife doesn't always believe everything I tell her. For whatever reason, I'm struggling to think of a concise, simple example of this that I'm openly willing to share. And I'm not talking about a nefarious, relationship-straining kinda doubt. It's more the "have to hear it from someone else" kinda deal. In all, it's pretty harmless, and it's never been over something too deeply serious. I'm gonna use Trader Joe's Crwamy Tomato Soup Seasoned Crackers for an theoretical example, actually. This actually didn't occur this way...but if I were somehow to get my hands on a boxful and try them out before she would, and told her that they taste like pizza, she'd probably be reluctant to try and may not even. She's not a tomato fan at all, and abhor tomato soup, so this is a product that would take some convincing for her to try. But, I guess these soup-flavored crackers made their way on a TJ's fan page somewhere, where a few people all said "These crackers taste like pizza!" and so with that, she made sure to get them, probably mostly for a snack for our tomato soup lovin' girls, but she was pretty pumped to give them a try without any prodding from me. I disagree, though. These crackers do NOT taste like pizza. Sure, there's a vague similarity. The earthy soup flavors with a zesty spice flair (pepper, garlic, etc) could be construed as marinara-esque. I didn't pick up on it much, but folks with more attuned taste buds *might* be able to pick up on the asiago cheese. Primarily composed of rice flour, these crackers are light and ultra crispy with a sizable crunch, with the bonus of being gluten free. Am I mad? Crazy? Would this argument hold up in court? I have no idea. You tell me! It's a rare condition that I link to the same seven-year-old post twice in a single week, but that's what we're gonna have to do here. Because in that post, Mr. Shelly states that the Mount Rushmore of Ice Cream would include Ben & Jerry's legendary Cherry Garcia. At the very least, the Vermont-based, Penn State-educated duo set the bar for cherry-flavored frozen desserts with their famous offering. Russ and I are both far too young and drug-free to be considered true Deadheads, but I do appreciate the ice cream as well as its late, great namesake and his music. By the way, Ben and Jerry, when will Bob Weir get an ice cream named after him? 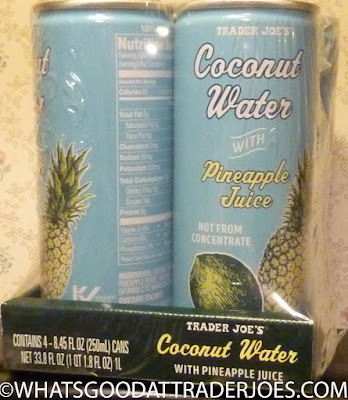 2) This particular product was available at Trader Joe's at least A DECADE AGO. See: this blogspot food review. In cases like this, it's anybody's guess as to whether this product was discontinued and then re-released, or whether it's been available all these years, somehow eluding our sights there in the frozen aisle. This recent tweet made me assume it was a new product. If it has been there all these years, quite frankly I'm shocked that we didn't hear more about it, because it's pretty fantastic. In some ways, the slight nuttiness of the soy milk blends with the chocolate and cherry flavors even better than traditional dairy milk does. I'm eager to try B&J's almond milk-based version now, as that might work even better still. 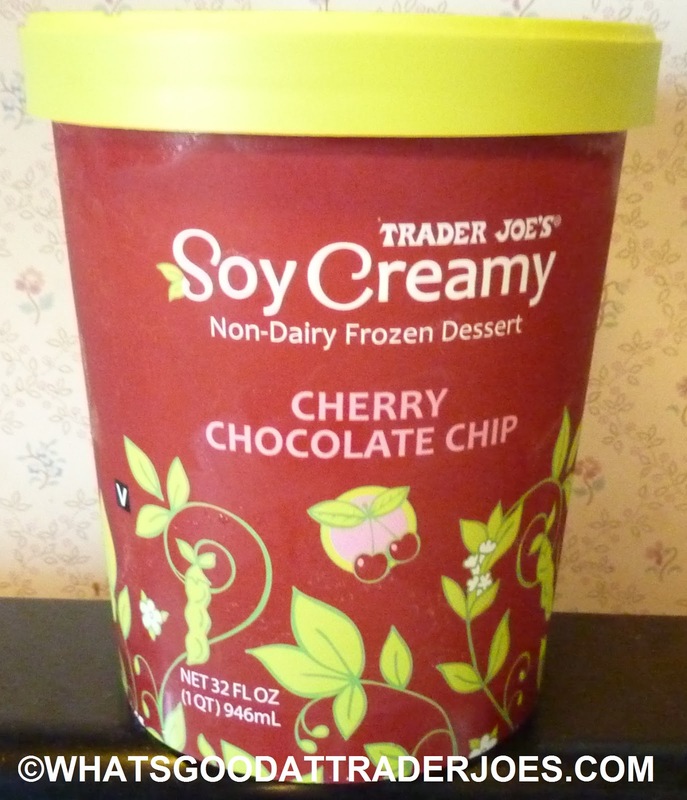 But as it stands, I'd hold this Soy Creamy flavor in higher esteem than the vanilla flavor we tried a while back. 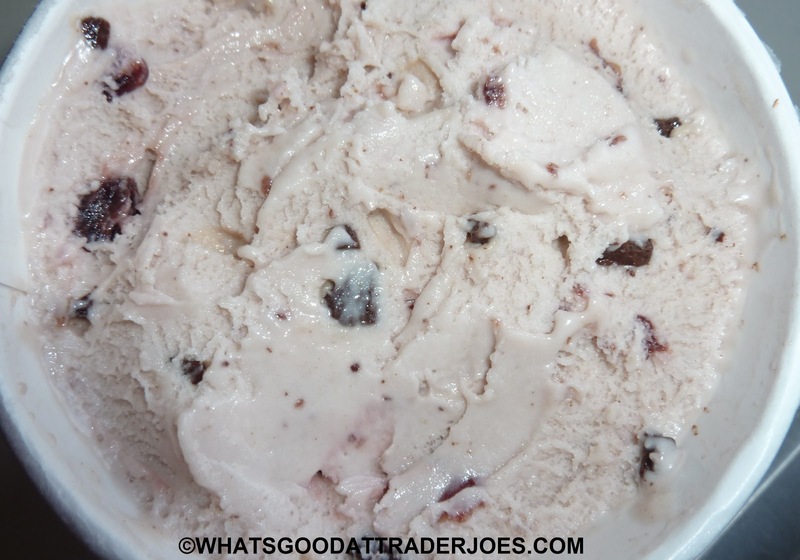 There are plenty of chocolate chips, and the cherries are pretty awesome. They're basically just sugared cherries—as sweet as maraschino cherries, but without the formaldehyde and radioactive Red 40. Plenty of 'em, too. The overall flavor is sweet, but not too sweet, with very little aftertaste. Sonia is a little under the weather right now and admittedly can't taste very much. She did like the bit of flavor she could detect, and of course she enjoyed the texture. Four stars from her. As someone who generally prefers dairy milk over soy milk, I think this product is worth 4.5, especially if you're lactose-intolerant or vegan. Oh, fast food breakfast sandwiches. They will always be my vice. A few years back, I'd eat two of them a morning a few times a week, and wonder why I was about a hundred pounds overweight. Those days have passed, and I'm in a better place and all, but still...can't quite give up the breakfast sandwich. Fortunately I'm down to usually only one a week now, on Fridays as a treat. Seems reasonable enough a prize for lasting thru a long week up to that point, with a little added something to get me the rest of the way home. I have my usual go-to spot, but anytime I hear anything new about a breakfast sandwich somewhere, my ears instantly perk. So only naturally, when I heard of the new Trader Joe's Chicken Sausage Breakfast Burrito, I had to give it a try. Not that TJ's exactly has a sparkling history of mornin' wraps. I'm with Nathan on those - gross and nondescript. The burritos, I mean, and not Nathan. He's a pretty good guy. As with most things, there's plusses and minuses here. First, it's in the refrigerator section, and not frozen. This means there's a definite fresher quality to the whole shebang that plays out through things like tortilla and egg texture, and there's no chance of any frozen little chunks here or there which torpedo any decent shot at breakfast. Indeed, everything's pretty on point in that regard. To heat, there's both oven and microwave options, which Sandy and I tried both - the oven, unsurprisingly, is the superior option by far, with the tortilla getting nice and crackery-cripsy, as opposed to soft and flaky and crumbly and kinda limp. Of course, you might not always have half an hour to heat a breakfast burrito, and if you did, you could probably easily make a better one yourself, so there's that. Each element is good and solid in its own right - tortilla is representative, the eggs of decent quality, the cheese present but lacking much distinction, and the chicken sausage and potatoes holding up their end of the deal. Problem is, there's kinda an overall lack of flavor. Nothing is good enough to really stand out on its own, and there's not even enough spice added to really do too much. Granted, this just means you could easily doctor with your favorite salsa or hot sauce or whatever else you wanted, if you wanted to. I kinda just wish there was something more to it - more sharpness to the cheddar, or more savoriness from the sausage, or a little peppery kick, or something - but nope. Overall, the sausage breakfast wrap is a good, not great, bite. It fills a void and uses up a lot of your discretionary nutritional values for the day. Sandy and I shared a burrito both times we had it for breakfast, and with some fruit and coffee it was more than adequate to hold us over til lunch. 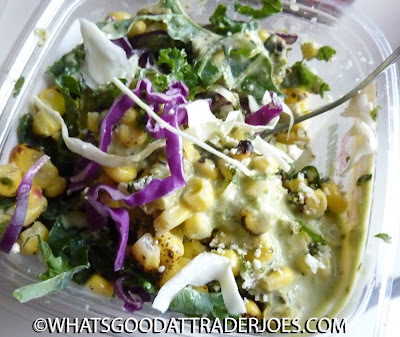 But I struggle to see the point of its existence - it's not often I'd find going to TJ's more convenient than a drive-thru or convenience store for a bite. Plus, I've learned through too many embarrassing shirt stains that burritos are absolutely not meant to be consumed on the go, which this seems tailored to...just odd. Maybe I'm completely whiffing on something here. Can't seem to muster more than a halfhearted three for it, while Sandy goes in a little higher. In addition to fraternity hazing deaths, sports victory-inspired riots, and a few other things too heinous to even mention on this blog, my alma mater, Penn State, was well-known at least regionally, if not internationally, for a number of less controversial things—at least while I attended. There was the famous Berkey Creamery, mentioned previously several times on this blog. There was THON, the largest student-run philanthropy in existence. And then there were colorful—although some might use the term "legendary"—long-time residents like Mike the Mailman, Zam Man the zamboni driver, and Gary the Willard Preacher. And in between painful morning gen ed classes and those mandatory phys ed credits that manifested themselves in the form of underwater basket weaving or, in my case, squash, we'd duck in to the cafeteria at West Halls for some grub. Everybody knew they had the best food of any of the half-dozen or so dining commons on campus, and it was close to many of the larger classroom buildings. The food was always warm and fresh and somehow tasted less "institutional" than the other cafeterias. You'd meet your friends outside Waring Commons and then head in out of the cold for an hour or so to recover your strength and inhale a chicken cosmo or two...and it was all building up to one grand moment: when the lunch ladies put a tray of piping hot, fresh-baked, ooey-gooey chocolate chip cookies out on the dessert window. Eighty percent of the room would hop out of their seats and rush to claim their cookies. In most cases, students would have prepared a glass of milk beforehand to have on stand-by. In other cases, they'd rush to the soft-serve machine to top their cookies with some vanilla ice cream. For a few minutes, we'd all commune in a moment of pure bliss greater than that following a win at Beaver Stadium, an aced mid-term, or finding out that your favorite band just booked a show at The Crowbar. Chocolate Chip Cookie Nirvana. This offering from Trader Joe's is the closest thing to that particular brand of ecstasy since those days at Dear Old State. 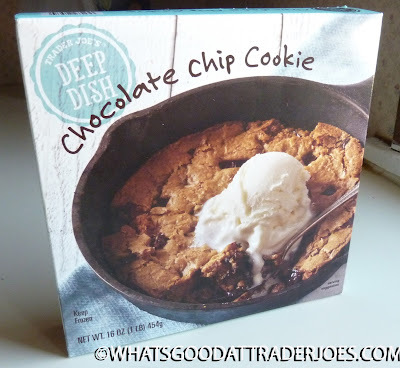 It's got the perfect amount of smooth chocolate chips and soft, chewy sweet cookie goodness. Like the West Halls cookies, this one is best served fresh out of the oven, accompanied by generous quantities of milk and/or vanilla ice cream. 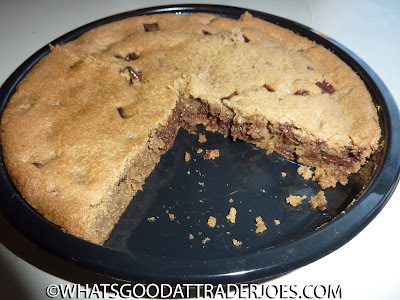 The "deep dish" breading is much thicker than any traditional chocolate chip cookie I've ever had, but that's just another reason this confection rocks. 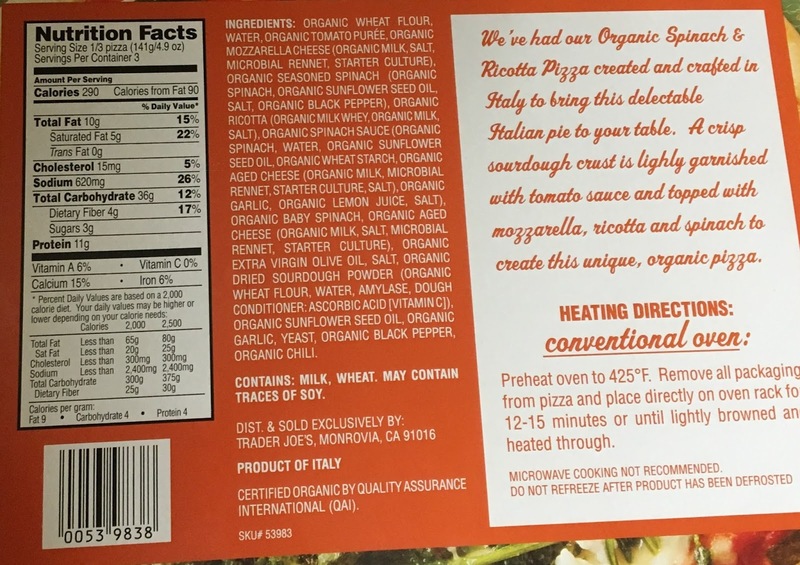 The box includes microwave directions...but I'm going to go out on a limb and tell you to just go ahead and fire up the oven for this one. It comes with an oven-safe tray, and it's very easy to heat, slice, and prepare. Despite its extreme softness, the cookie still maintained enough structural integrity that I was able to pull most of the slices out fully intact. The product melts in your mouth, goes down nice and easy, and would pass for restaurant-quality with flying colors. 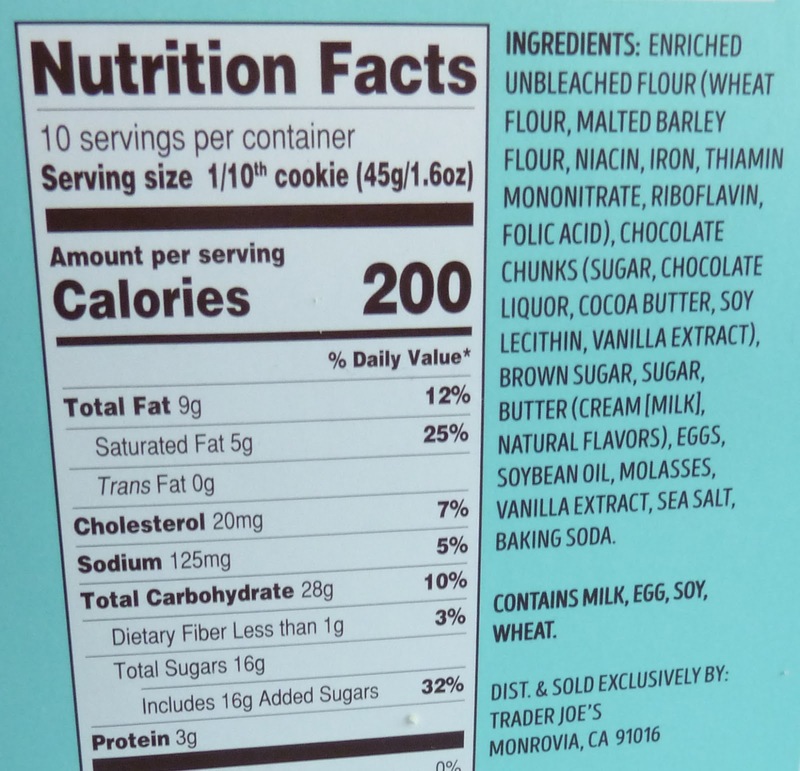 The cookie sells for $3.99—a fair price, considering you're paying for quality ingredients and unadulterated scrumptiousness...but good luck getting 10 servings out of it. It's probably more like four. So this weekend is the Super Bowl! A couple years ago, I could plop down, turn any old football game (much less the biggest one of the year) and be reasonably entertained. These days? Not so much. Not exactly sure why, but pigskin doesn't have the same appeal to me in the past few seasons. I didn't even watch the Super Bowl, opting for a date out with my wife including going to emptiest Cheesecake Factory ever. I've watched maybe five games over the past three seasons. My guess is, watching a bunch of big guys in tights run around, fight over a ball, smack each other senseless with concussions, only for every play to be dissected in slo-mo for ten agonizing minutes on "instant replay" with continued live look-ins to whatever funny grimace the head coach is making just doesn't hold the same appeal to me, and for my small amount of attention I can give the sports world, I choose to devote it to baseball. 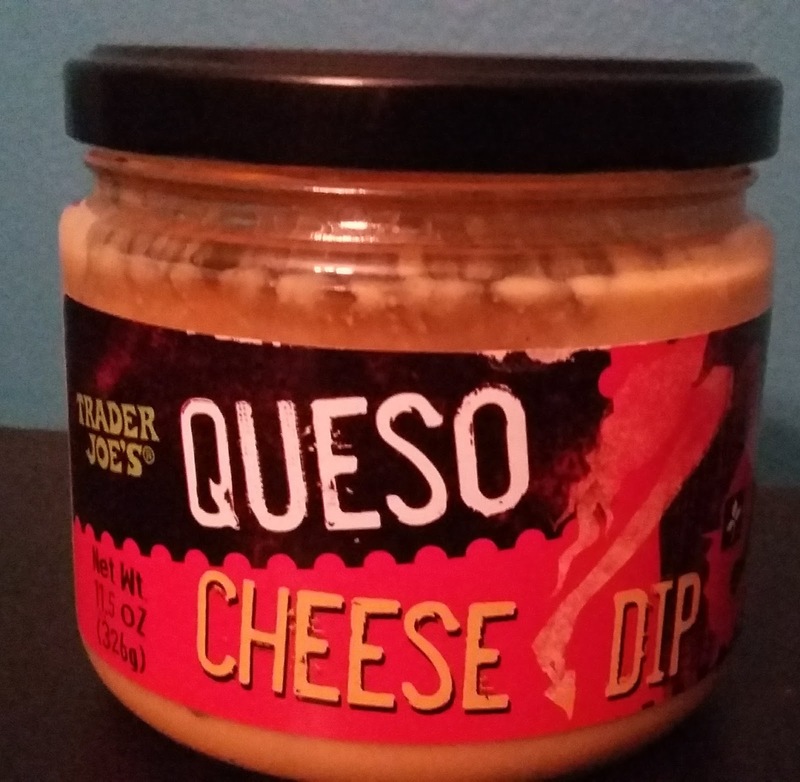 It's kinda the same for Trader Joe's Queso Cheese Dip. I'm not sure how this blog has been around for like eight years and we've never mentioned this product...but it's true. If the TJ queso would have come up in review rotation years back, I'd probably LOVE this stuff. I mean, it's semi-spicy-salsafied cheese, how can it go wrong? Well, for whatever reason, it just doesn't cut it for me any more. Sandy and I picked up the diminutive jar for a recent taco night in the name of trying something different. Shoulda sticked to the classics. The cheese is kinda runny and gloppy and absolutely needs to be warmed to be palatable. I tried some cold just now to revisit the taste - cold, clammy, and kinda booger-y. Not recommended. 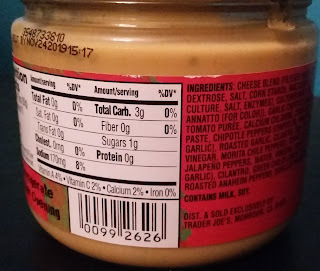 It's apparently some sort of cheese blend that's primarily cheddar according to the ingredient label. 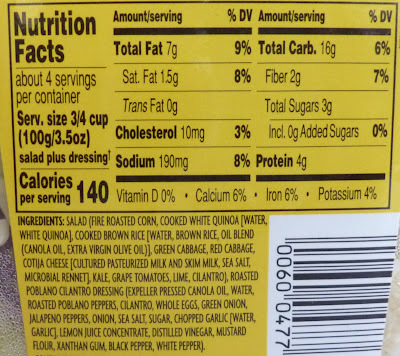 I will grant that it's better quality nacho cheese than the stadium standard yellow sauce. But not by all that much. There's still a fake, salty taste to it. The spices and peppers do convey a little warm heat, but is generally inoffensive. 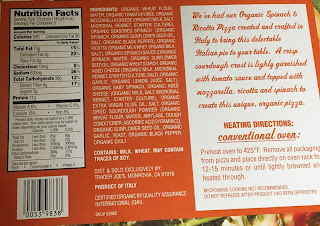 If anything, it tastes a little more towards pickled and vinegar than actual heat. Overall, it's just not an impressive product. Anyways, if you need a dip for the game, go for it. You could do worse, I'm sure. But I'll be looking for something else, as I am planning on watching at least some this weekend. I grew up an Eagles fan and am watching more out of obligation than anything, even though I can't tell you in 100% certainty if Doug Pederson is the head coach or quarterback after that Wentz guy got some sort of big ouchie. Won't have too much feeling about the outcome either way, I'm sure. Kinda the same for the TJ queso dip - mehs abound.